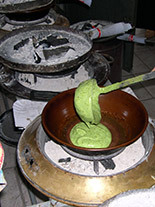 The manufacturing of sweets uses naturally l'«Bronte's gold» (the pistacchio) that, especialy in the preparation of pastry, cakes, ice cream, nougat, etc., gets exalted for the exceptional taste quality. Other traditional ingredients are the cottage cheese, the dry fruit (walnuts, almonds, figs, hazelnuts), raisin, mustard, honey, cooked wine (made with prickly pears juice). The confectioners of Bronte, following familiar tradition, continue to use genuine and local ingredients have become famous for the very many recognitions received in several exhibitions. With the precious fruit that nature has put at their disposal are particularly exalted two classical brontese delights, ice cream and pistachio cake, but also in many other refined sweets: pistachio flavored liquors or milk, crushed pistachio sauce, pistachio cream, the classic pistachio fillets, nougats, pastry (plain, with icing sugar, or chocolate covered), ...and innumerable other delicacies of unique taste. 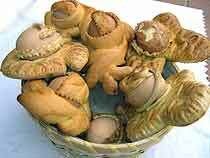 The preparation of some sweets, according to peasant tradition, is often articulated by the calendar (Easter, the Commemoration of the dead, Christmas, Carnival) or the seasons. 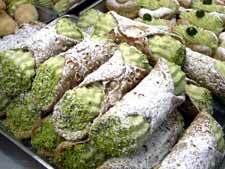 Besides those based on pistachio, are traditional sweets the almonds pastry, the fried ravioli filled with seasoned fresh cottage cheese, the fillette, le nuvolette (an oval, soft sweet made with flour, starch and eggs), i cuori (almond paste), the sfingi (a deep fried mix of boiled flour, sugar and eggs), the panitti (typical Christmas sweet filled with crushed almonds, pistachio, dried figs, honey), the vino cotto (cooked wine), the "mastazzori" and the mostarda made with the particularly sweet prickly pears juice. 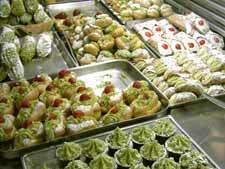 Tipical sweets of Bronte (genuine and local ingredients). 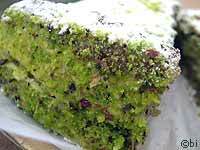 Paste, fillette, (fabu­lous) ice cream, doves, panettone, nougat, biscuits, cakes, olives: the pistachio of Bronte is traditionally the main ingredient in the recipes of the typical Bronte sweets. 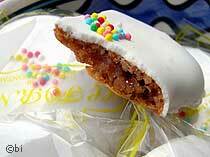 The Easter lamb is a sweet, made with variable weights and measures only during the Easter holidays. 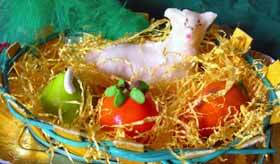 Is shaped like a lying down white lamb, decorated with flags and flowers, among colored fruit. The sweet, made with soft "pasta reale" (special almond pastry), once used to be the Easter gift that the man in love gave to his fiancée: the heavier the cake, the sweeter was the affect demonstration (and, naturally, richer the wallet!). The mostarda, a traditional Christmas cake obtained (like "cooked wine" or "mastazzori") from the tasty prickly pear of Bronte's skiing, which recently had the "dop" recognition of the European Union. To recognize it from imitations, just check that the shape of the volcano is on the label. The production area of ​​the "Ficodindia dell'Etna" is part of the province of Catania, affected by the effects of the eruption of the volcano, and is included in a range of altitudes ranging from 150 to 750 meters. 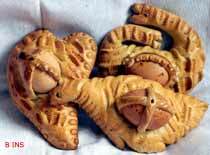 The "cullura" more than a sweet, con­sti­tuted the prin­cipal food for the Easter Monday picnic. Pregnant and bulging represents the feast of life that comes back after the mourning. Consists in a mixture of flour, lard and sometime sugar. The dough, worked in a particular way, is shaped in various forms (a flower, a dove, a fish, a basket, a lamb etc.). 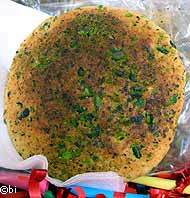 In the paste are incorporated two or three raw eggs with shell, other strips of pastry are placed on top to cover the eggs and the all thing sprinkled with "iavuricchi" (small multicolored confetti). Then everything is baked in a stone oven. 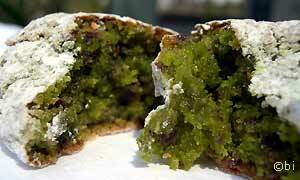 The "filletta", typical brontese sweet, is very ancient, with the characte­ristic shape per­fectly round. 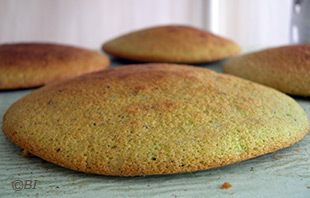 Is composed with simple in­gre­dients: flour, sugar and eggs (and, also pistachios, if you want to enrich the weet). Is made with a technique, perfected during many years and handed down from generation to generation, that produces a tasty and very soft sweet, perfect in its shape exactly circular. 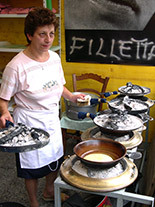 The cooking requires much skill and no distraction as each filletta is cooked singularly in a small frying pan of butter greased copper, put over a brazier of hot ashes and covered with a lid on which are placed other hot embers. Is sold by private confectioners and in all Bronte's bars, wrapped in a special, transparent plastic bag to preserve longer the flavor and the typical softness. 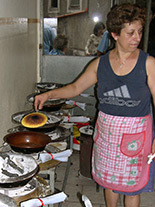 Some phases of the preparation of the cake, the «Filletta», cooked in special pans placed between two braziers. In the plural, it strangely becomes masculine: fillets. It is sold by private individuals and in bars in Bronte, wrapped in a particular sheet of transparent plastic to preserve the aroma and the typical softness for a long time. His destiny, now consolidated, is to be donated during happy or painful events but above all, or better, to get a little help, the ... recommendation (good and sweet as it is and easily makes me too .. ..miracoli !). 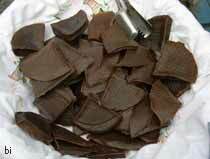 And over the years ... they have been given "wagons" of soft fillets! And, given the, we have never stopped.